I not a fan of annuals, mostly because their publishing is so haphazard. I know, annual implies that they come out once a year, but in the world of comics, numbered annuals may be published over five, six, seven years, and then they stop. Five or ten years later, they resume, and are numbered beginning with #1 yet again. There’s no real consistency to the schedule, no plan in place. 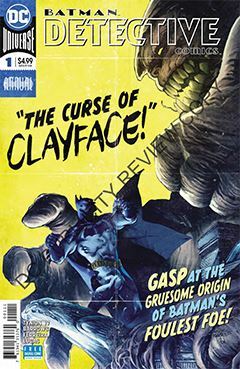 In the case of Detective Comics Annual #1 (2018 edition), we are presented with the origin of Clayface (the recent Basil Karlo version). Originally, Basil Karlo was introduced in the Golden Age as an actor driven insane. A second Clayface, Matt Hagen, was introduced in Detective Comics #298. The two versions were merged in an episode of Batman: The Animated Series, and that’s pretty much the version we’re presented here. It’s a bit of a story within a story, as actor Matt Hagen is driven insane by the addictive properties of Renuyu, a putty his father used for creating masks as a monster actor. Hagen’s career outshines that of his father, but a terrible car accident results in Hagen’s dependency on the clay to maintain his film career. But his sanity begins to slip, and he becomes an adversary for Batman. With so many ret-cons of various characters over the years, it becomes a challenge as to how to reconcile them all for the current generation of readers. What to leave, what to keep in may vary from one creator to another. Batman: The Animated Series did very well in that regard, and I am pleased to see DC Comics following its lead by only slightly modifying that particular version of Clayface. It aint broke, so they didn’t fix it. They merely added a layer or two, and that’s okay. The artwork by Eddy Barrows and Eber Ferreira is excellent. It can be much harder than one expects to render a deformed face, or a villain of clay, but they pull it off quite effectively. Flashback layouts involving Hagen’s father use film borders extensively – perhaps too much – but it adds to the scope of the segment. And their cover is a “reel” treat for fans of classic movie posters.